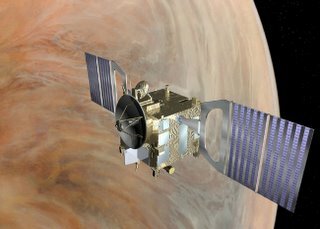 CHALLENGE: From BAIKONUR to VENUS and Beyond! Our one and only evening/morning 'star' will soon be visited and we look forward to a lot of information about our nearest planetary neighbour. I've been personally fascinated by Venus ever since reading C.S. Lewis' Space Trilogy. Not to mention a general yearning to get into "outer" space - most probably the result of being a Trekkie! Update on June 29, 2013 - long past the Venus flyby Voyager 1 is heading into OUTER space! It's official, Voyager has hit OUTER space, the very first man made object to achieve this incredible task! Read all about it by following the link above. "Voyager 1 first detected the increased pressure of interstellar space on the heliosphere, the bubble of charged particles surrounding the sun that reaches far beyond the outer planets, in 2004. Scientists then ramped up their search for evidence of the spacecraft's interstellar arrival... coronal mass ejection, or a massive burst of solar wind and magnetic fields, that erupted from the sun in March 2012 provided scientists the data they needed. When this unexpected gift from the sun eventually arrived at Voyager 1's location 13 months later, in April 2013, the plasma around the spacecraft began to vibrate like a violin string. On April 9, Voyager 1's plasma wave instrument detected the movement. The pitch of the oscillations helped scientists determine the density of the plasma. The particular oscillations meant the spacecraft was bathed in plasma more than 40 times denser than what they had encountered in the outer layer of the heliosphere. Density of this sort is to be expected in interstellar space. We literally jumped out of our seats when we saw these oscillations in our data -- they showed us the spacecraft was in an entirely new region, comparable to what was expected in interstellar space, and totally different than in the solar bubble"
What a feat for science! I am excited and fascinated with the news Voyager 1 is out of our system, has entered interstellar space and is heading for an unknown destination (!). I jumped out of my seat when I read this piece of news. Voyager 2 too may follow big brother soon and be out of our ss. Can you imagine the excitement of some ET who comes across this message from us in a distant future? Maybe I will be THAT ET. By the way Sam, isnt Mecury too a dawn/dusk 'star'?